Mark Anthony Harris was born February 13, 1961 in Bryan, Texas and died on August 2, 2018 in Austin, Texas at the age of fifty-seven years. He was one of nine children born to Otto and Elisabeth Harris. Mark was raised in North Zulch, Texas and a graduate of North Zulch High School. Mark spent his entire life working construction as a heavy equipment operator, and he was known to be one of the best blade operators around. He traveled around the world as a heavy equipment operator, putting in a lot of hours on the job. 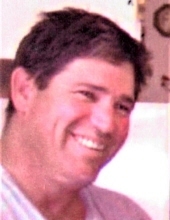 Mark was a lifelong resident of North Zulch, Texas. Mark will be remembered most for his heart of gold and generous personality. He would have given the shirt off of his back to help someone if he was asked to do so. Mark was preceded in death by his father, Otto Harris. Survivors include mother, Elisabeth Harris of North Zulch; six brothers, Terry Harris (Tammy) of Bailey, CO, Eric Harris (Zina) of Bryan, Charles Harris (Donna) of College Station, Steven Harris (Carla) of Edge, Ernest Harris & George Harris, both of North Zulch; two sisters, Mathilda Musgrove (Roy) of Conroe & Lynn Harris (Travis Bosquez) of Bryan, as well as, numerous nieces, nephews, great nieces & great nephews. Funeral services for Mark will be held 2 P.M., Sunday, August 5, 2018 at the Madisonville Funeral Home in Madisonville, Texas. Rev. Glenn Connor will officiate the service and interment will follow in the Wealthy Cemetery. A public visitation will take place Sunday before the service from 12 Noon to 2 P.M. at the funeral home. To send flowers or a remembrance gift to the family of Mark Anthony Harris, please visit our Tribute Store. "Email Address" would like to share the life celebration of Mark Anthony Harris. Click on the "link" to go to share a favorite memory or leave a condolence message for the family.